Once again, in pursuit of getting you the best insights, advise and content, Magenticians once again brings to you, an influential personality in the world of Magento. Say Hello! To Kalpesh Mehta. What he’s doing and where he’s at now? He is currently working as a Development Manager at Corra. He has vast experience in the field of Magento with multiple Magento development certifications. His name is also featured among top 50 Magento Contributors. Through his vast experience with Magento and adding multiple development certifications to his resume, Mehta is working as a Development Manager at Corra. Oh, that’s not all, he’s also managed to get his name amongst the top 50 contributors for Magento. Muneeb: The basics, when, where and why? Kalpesh: I come with more than a decade’s worth of experience in web development, with 8 years just for Magento. I began working on Magento in 2011 in Mumbai and after, worked on several projects as Team Lead, Magento Developer, Architect, Tech Lead and now, as a Development Manager. I am a 5 time certified member of the Magento Advisory Board too. Muneeb: Amazing. But, I have to ask, why Magento when there are others out there? Kalpesh: I didn’t choose Magento, it chose me. I worked for a startup company in 2011 where I was asked to build a site on Magento. Since I had some knowledge in the Zend Framework, it was easier than imagined with my little experience, enough to get the job done. I was learning more Magento along with 4 engineers, all raw. we built the entire website in 3 months with lots and lots of hard work and dedication, of course. We launched the website and I was promoted as the Lead. Sure we had some issues in the beginning but the platform is so diverse and engaging, it was a joy to work harder to see the fruit. Together, as a team, we managed to read through blogs and tried what we knew. Some of the ones I remember were from Alan Storm, Mukesh Chapagain, Inchoo, and BelVG. Check them out, you’ll know what I mean. The long version is that Magento is a very flexible, scalable and powerful eCommerce framework that can handle from smaller mom and pop stores to the giant billion dollars eCommerce stores. Muneeb: Aite, some helpful resources for the newbies to learn Magento, be nice! Muneeb: You’ve got loads of certifications, I forgot how many, any tips we can get some? What role has these certifications played in your career? Muneeb: Featured as one of the 50 top contributors of 2018 for Magento, what’s in it for you? Kalpesh: Happiness for starters! It’s an honor, to say the least. I have already spent a crazy amount of time last year to make Magento better. I submitted some critical bugs to Magento, participated in Magento 2 Certified Professional Developer Plus workshops, included an entirely new topic for Magento Security, organized 5 Magento meetups in Los Angeles, created a security extension (on Github), blog contributions and spreading security awareness by advocating Magento Security in the community. So in short, It means a lot to me. Muneeb: What’s the future for Magento? Any guesses about 2020? Kalpesh: Magento’s goin’ bigger than ever being a part of Adobe now. By 2020, many new features are to come like Native PWA, GraphQL, MSI, Page Builder and Internal API. All fully integrated, baked in nicely to give a wonderful experience. Expect Magento to be featured as one of the Ä products. Cool ain’t it? Muneeb: Do you like your office? 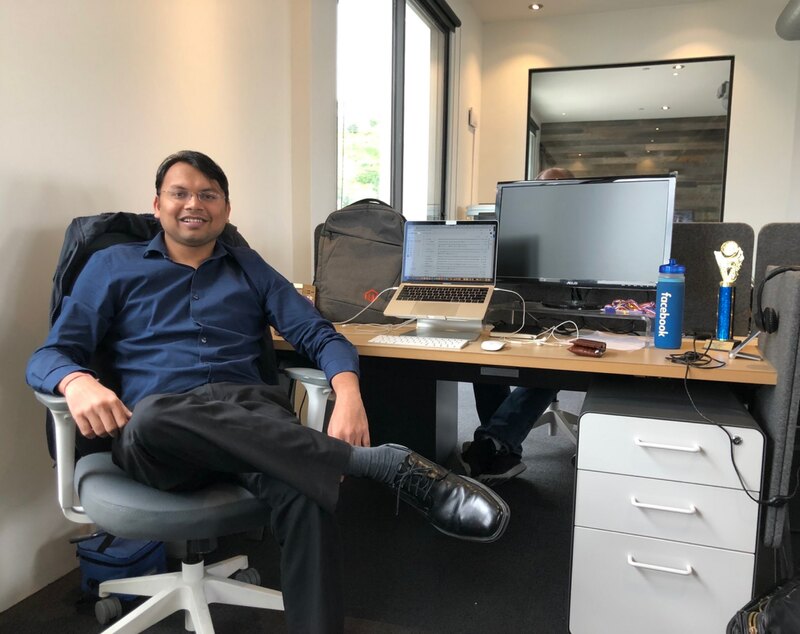 Kalpesh: Corra is awesome as a Magento Global Elite Solution Partner, they give me good work-life balance by allowing me to work 2 days per week from home. They also give the opportunity to grow, which is not very common. Work culture, competitive benefits, flexible hours and WFH policy, allowing me to participate in various Magento related events, transparency and diversity is what I love the most. Muneeb: What about Magento events? Any views? Kalpesh: Yeah, I love participating in Magento community events, it gives me the opportunity to network with other community members and gather information on the latest trends in the Magento world. It also allows me to make new friends and knowing the community members whom I have worked with for many years on SE and forums, to see them face to face is awesome. It helps community members to get in touch with each other and share their experience and ideas too. Muneeb: What about the Magento community? What improvements would you like to make it more awesome? Kalpesh: The Magento community is already awesome, I am glad to be a part of it. I like the people in the community who are also open to giving their opinions, positively or negatively, in a constructive manner. I love the fact that Magento is also listening to its community members, and implementing the changes based on community feedback. I want this to continue. Muneeb: So If not a Magento dev, then what? Muneeb: That’s nice, so what was the funniest thing that happened during a project? Kalpesh: I was changing some functionality in one of the projects, but the changes were not reflecting on the storefront. I flushed the cache several times, reindexed and also saved the file multiple times. Kalpesh: Family, watching Bollywood movies and surfing on the internet in my free time, if I am free, that is. Muneeb: Finally, Who would you like to see interviewed next by Magenticians? Kalpesh: I would like to nominate Rakesh Jesadiy. You can connect with Kalpesh on Twitter and LinkedIn.